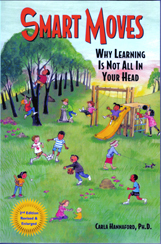 Carla Hannaford's best selling book on movement and learning. This internationally acclaimed book brings the latest insights from scientific research to examine the body's role in learning, from infancy through adulthood. Carla Hannaford presents the mounting scientific evidence that movement is crucial to learning. With real-life poignant examples, she exposes the effect of traditional educational practices that ignore this link. Smart Moves explores the many factors that contribute to the growing plague of learning disabilities: TV viewing, different foods, environmental factors, as well as the devastating effects of stress, and its consequent production of neurochemicals like cortisol that inhibit learning. Dr. Hannaford offers clear alternatives and remedies that people can put into practice right away to make a real difference in their ability to learn. She advocates more enlightened educational practices for homes and schools including: a more holistic view of each learner; less emphasis on rote learning; more experiential, active instruction; less labeling of learning disabilities; more physical movement; more personal expression through arts, sports and music; less prescribing of Ritalin and other drugs whose long term effects are not even known. Smart Moves also offers instructions for performing the Brain Gym movements. These are simple, coordinated exercises that help build neural pathways so critical to learning and help reverse the effects of neural damage in a natural drug free way. With a new Introduction by Dr. Candace B. Pert, author of Molecules of Emotion. "A major work of profound importance to our understanding of child development and education. Through a brilliant analysis and synthesis of epochal neuroscientific research, she opens a window of understanding into the workings of our mind/body that is dramatically pertinent to children and adults." "I have never seen a better guide to creating more effective learning situations in home and school." "This book should be required reading for teachers and parents." "Smart Moves is a powerful revelation of the full potential of the human mind and body. Carla Hannaford shows why and how the body plays an essential role in all learning. Her book will suprise, inspire, and delightfully instruct every reader." Carla Hannaford, Ph.D., is a neurophysiologist and educator with more than three decades of teaching experience, including twenty years as a professor of biology and four years as a counselor for elementary and intermediate school children with learning difficulties. Since 1988 she has been an internationally recognized educational consultant, making hundreds of presentations throughout the world on the neural basis of learning and educational kinesiology. She was selected as a guest educator with the AHP-Soviet Project and has received awards from the University of Hawaii and the American Association for the Advancement of Science for outstanding teaching of science. She lives in Kalispell, Montana.